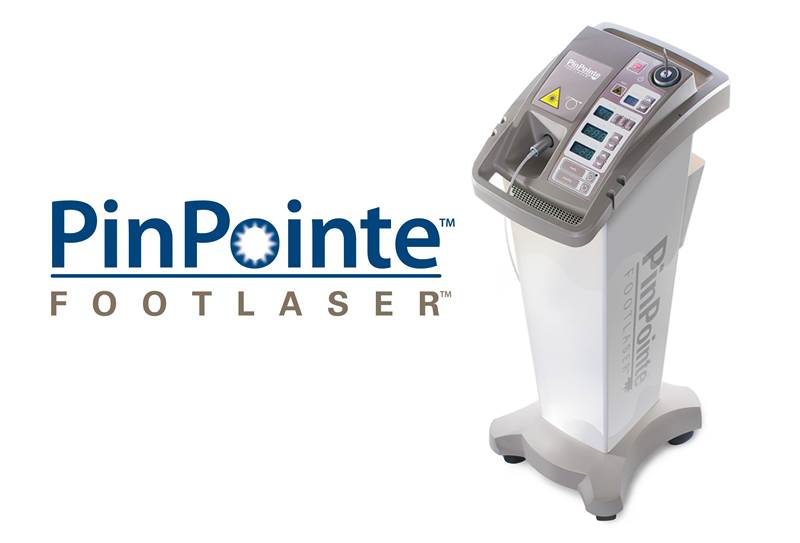 The PinPointe FootLaser is the first clinically proven laser for the treatment of patients with onychomycosis, or nail fungus. Toenail fungus is characterised by thick, unsightly, discoloured nails. Fungus-infected toenails can be irritating, embarrassing and painful. Leaving a fungal infection untreated can result in it spreading to other toenails, the skin on the feet and even the fingernails. Severe cases can impair one’s ability to walk or lead to painful ingrown toenails. Safe and effective, this in-clinic treatment is pain free, has no harmful side effects, and typically takes only about 30-minutes to complete, turning your discoloured and disfigured nails into clearer, healthier looking nails. It’s important to seek care when you first notice signs of infection. For years, the only treatments available for toenail fungus were topical and oral medications, or removal of the nail. Typically, the medications were largely ineffective and removal of the nail plate was painful and debilitating. However, a new breakthrough in technology is making it possible to get rid of your nail fungus fast – a new procedure known as PinPointe FootLaser. The new, patented laser technology treats nail fungus safely and quickly with no drugs, no anesthesia and no pain. Talk to the West Ryde Podiatry Clinic about treatment options currently available for nail infection to determine which is the right treatment for you. The Pin Pointe FootLaser is the first clinically proven laser for the treatment of patients with onychomycosis, or nail fungus. The laser produces multiple light wave lengths that seek out the fungal cells. The laser only targets the fungal cells and does not harm or destroy the skin or tissue surrounding nail. The laser light penetrates through the nail to the diseased cells on the nail bed and roots where the fungal infection resides. There is no pain during laser treatment. Since the treatment is not painful, no local anesthesia or injections are necessary. If the nail plate is loose, sometimes during debridement of the nail prior to the treatment you may have minimal discomfort. Most patients describe the laser treatment procedure as being comfortable with a quick, small pinch at the end. Immediately following the procedure, your nails may feel warm for a few minutes. How long does the laser treatment take? The actual laser treatment process takes about 20 to 30 minutes if treating all ten toes. To prepare your nails for the procedure, our podiatrist will perform a professional medical pedicure using sterilized equipment. This process is painless and includes thinning the toenails to allow the laser to more effectively penetrate the nails during the treatment. Stop suffering from unslightly nails. Ask about the PinPointe Footlaser treatment! Available at our West Ryde Podiatry Clinic, Visit the website (www.westrydepodiatry.com.au) and contact us today to book your appointment or call us on (02) 9808 1966.